My name is James Beeson and I am an award-winning beer writer and accomplished food & drink journalist, offering digital communications expertise for the craft beer industry. I offer a wide range of services including but not limited to: copywriting, photography, PR, events planning and promotion, social media strategy and consultancy. If you’re interested in hiring me, please get in touch via the Contact section of this site. With over five years experience working in the sector, including two years as a reporter for a national trade title, James is widely regarded as one of the beer industry’s brightest young talents. He has written about beer for a number of publications including The Morning Advertiser, Ferment Magazine, The Brewers Journal, The i newspaper, Belgian Beer & Food magazine and The Full Pint, and has won two British Guild of Beer Writers’ awards for his work, including Best Young Beer Writer in 2017. James began writing about beer in 2015, starting his own blog whilst still at University. After graduating with distinction from his Journalism Masters at City, University of London, James joined The Morning Advertiser as a Food & Drink reporter in May 2017. During his time on the title he broke records for the most viewed story and the most read author in a calendar month, and had several stories picked up by newspapers including The Telegraph, The Sun, The Times, The Daily Mail, Metro, CityAM and The Mirror. 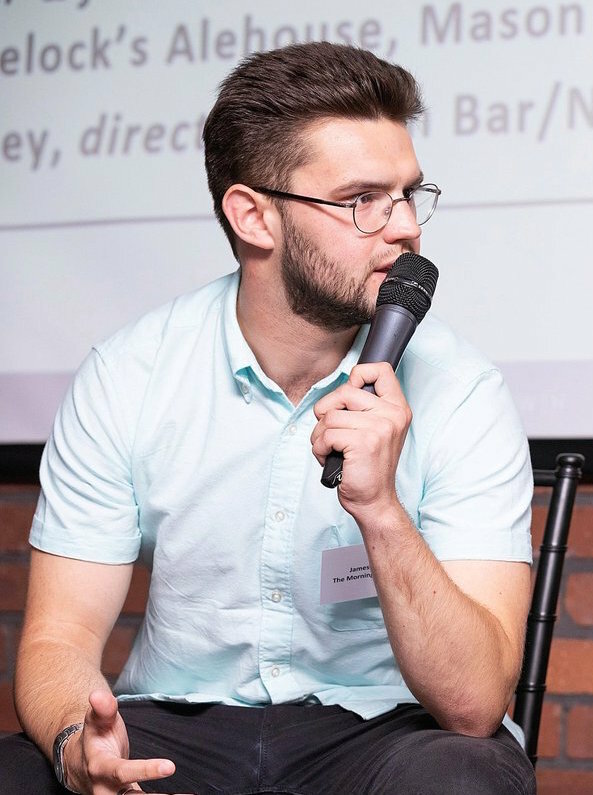 After leaving The Morning Advertiser in September 2018, James has continued to work as a freelance food & drink journalist, as well as undertaking work as a copywriter, consultant, photographer, social media and events manager and PR. His clients have included: The Beer & Cider Academy, Honest Brew, The Beer Boutique, Stannary Brewing Co, The Royal Oak, Exeter University Real Ale Society and 16 Tun. To see examples of James’ photography, please visit the Photography section of this site. To read more of his writing, check out the Stories page. If you’d like to get in touch with James, then visit the Contact page, or email jdbeeson@hotmail.co.uk.